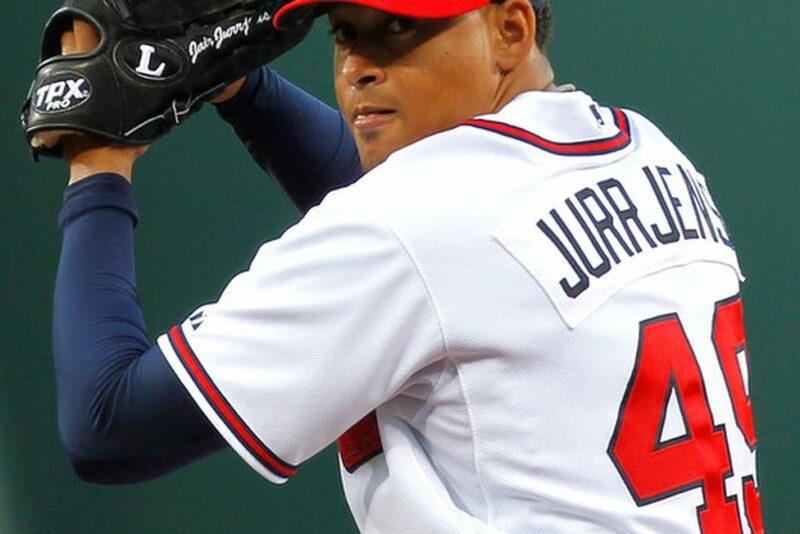 The Independent Long Island Ducks of the Atlantic League have signed former Atlanta Braves All-Star, Jair Jurrjens. Inking deals in the independent leagues never really registers on national scale, but to really put this into perspective, Jurrjens is a great signing not only the the Ducks, but for the continuation of his career. His career began with a bang. After being traded by the Detroit Tigers to the Atlanta Braves for Edgar Renteria in 2007, he was one of best rookie pitchers in the game. Going 13-10 with a 3.68 ERA for a Braves team that won only 72 games, he earned enough votes to place third in the 2008 ROY voting behind Geovany Soto and future Hall of Famer, Joey Votto. He followed that up with an even more impressive year. Taking the number two spot in the rotation with Javier Vasquez, he went 14-10 and dropped his ERA by over a run (2.60). He led the league in starts with 34, placed third in ERA, finished ninth in innings pitched (215), and helped the club get over the .500 mark. Jurrjens was hampered with injuries in 2010, but in 2011 he reached his full potential by making the MLB All-Star team. Unfortunately, his surgically repaired knee would not hold up for the season. He made only four starts following the All-Star game and was never the same. Over the the next few years, the right-hander with so much promise bounced from team-to-team (Baltimore Orioles, Cincinnati Reds, Colorado Rockies, LA Dodgers) winning just three more games at the MLB level. Fast forward to 2017 and sitting in the free agent pool, he pitched so well in the World Baseball Classic (11 innings. three runs on 12 hits, four free passes and struck out nine), that the Dodgers signed him to a minor league deal. His time with the Dodgers was short lived. In the midst of his father’s passing, Jurrjens was battling depression and that was followed by a failed drug test resulting in an 80-game suspension. His appeal was denied after he stated that his sample included prescribed supplements to treat depression and personal health issues. That was then this is now. 2018 is a new year and a new start. The Long Island Ducks have a long history of success (three league championships and five division championships) and the addition of Jurrjens’ 16 years of professional experience will no doubt help the club. Ducks President and GM Michael Pfaff, who is very familiar with players of all levels who have been in the Atlantic League and used it as a building block for future opportunities, is excited about what he can bring to the table.